Hutchies’ story really begins in 1911, when John “Jack” (I) Hutchinson left his home in England and set sail to Australia with his family to start a new life. Whilst Jack probably found work when he arrived on Australian shores in 1911, Hutchies’ first written record of work was with the Qld state government to construct a new kitchen at Fort Lytton on 29th January 1912. Jack survived his early days in Australia by winning local government work. This changed in 1914 when he won a contract to construct his first CBD building for a private company - a substantial new brick warehouse. Jack I’s sons – Eric & Jack II – helped their Dad with the newly founded business, but they also quickly became involved the local community. It was not too long after this that Hutchinson men played a part in founding the Wynnum Districts Soccer Club (now known as the Wolves FC). Not much has changed since those early days within Hutchies as community involvement is still very much part of the company culture today. From as early as anyone can remember, Jack I was simply referred to as “Hutchie” which became the colloquial, endearing company term that we use today. Within a decade, Jack I was considered an experienced and successful businessman by his peers. Jack's first known business premises was located at his home in Manly (pictured), but in 1921, he decided to purchase a more centrally located office & yard for Hutchies on Montague Road in South Brisbane. Hutchies won the prestigious 7000 seat Ernest Baynes Grandstand which remains part of the RNA Showgrounds today. Hutchies was building everything it could take on – including the purpose-built specialist medical building, Ballow Chambers in Spring Hill – a building that also remains today. Work spread to regional locations such as Roma and Mitchell. Jack I entered the Qld Master Builders and became President – a position he held for three years as Australia was in the grips of the Great Depression. Jack II married Lily Collins in 1932 and two years later on October 17, Jack III (Jack Snr) was born. Sadly, two days later, Jack I’s wife Ellen passed away. Hutchies began work on Murwillimbah Hospital in 1937. It was opened in August 1939 and at the time was one of the most modern and cutting edge hospitals in regional Australia. Standing at a hefty 15 metres, it was the biggest structure ever raised in the district. By the late 1930s, Jack I still owned 100% of the business. Jack II and Eric finally decided to approach their father for a partnership after 15 years managing the business. J Hutchinson & Sons was officially formed. Despite enduring the Great Depression and the onset of World War II, J Hutchinson continued to prosper with 400 company members. Disaster almost struck Hutchies when a large fire broke out next door to its office and yard. Luckily a quick response from the fire brigade saved the company from a huge loss. War came to Australia in 1942 and Brisbane was seen as a strategic target during this time. Urgent action was taken to protect the population in case of air raids. In less than 12 months, Hutchies had built 14 major air raid shelters in the Brisbane CBD & surrounds. The war didn’t stop Hutchies – it continued to build a lot of works associated with the army including building part of the massive £400,000, 35,000 person Camp Cable near Logan Village. After the war ended, the company took up the opportunity to support the bustling manufacturing sector by diversifying its portfolio to construct more industrial buildings. With Hutchies recognised as a highly respected and significant player in the industry, it maintained a good book of work. Jack II moved into the six bedroom family holiday home in Surfer’s Paradise and Eric’s son John began work at Hutchies. At the young age of 17, Jack III aka Jack Snr attended his first Hutchies Christmas party at the Baroona Labor Hall in Caxton Street, Paddington. This is where the lanky, sandy-haired schoolboy first caught sight of his future wife – June Smith. She happened to be the daughter of a valued labourer at Hutchies – William (Bill) Smith. Jack left school to become an apprentice carpenter and became close with June after partnering her in a three-legged race at a company picnic. 6 years later, they married and John Scott Hutchinson arrived soon after. Lindy, Wendy and Kenneth became Scott’s younger siblings in the years following. Despite all that was happening for Hutchies as a family, the 50s were not the best time for the business – with projects not being completed on time, its reputation began to tarnish. With Jack I in his 80s, and Jack II and Eric in poor health, the family considered closing down the company. 1960: What should Jack III do? Jack III was working for the department of works at the Qld Government in a secure position. His father, Jack II, urged his son to stay in his job rather than take a chance leaving to help with the ailing family business. 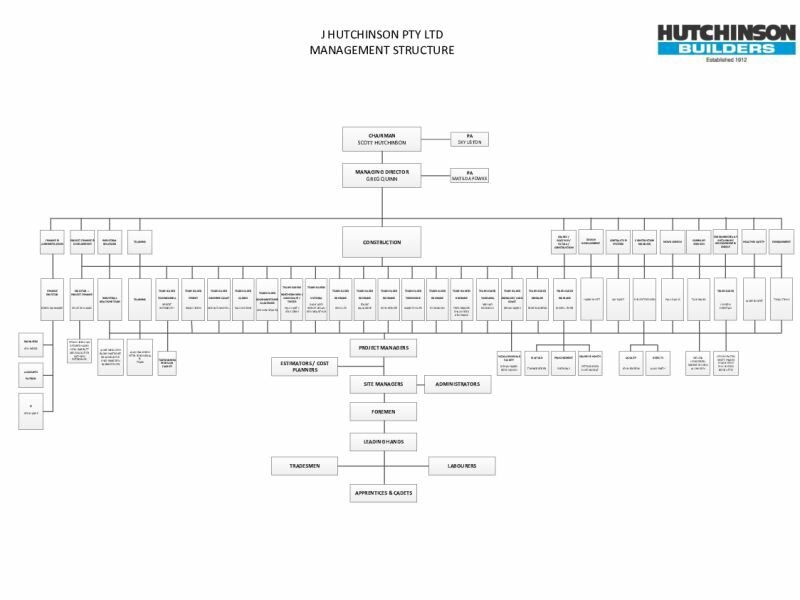 The company was lagging behind with uptake of technology and although still won some projects on the back of its reputation, Hutchies was slow to adapt to change. Costs on the Camden project blew out and the apartments were slow to sell. Hutchies was left with a large debt which was very troubling in its current weak financial state. Jack II was able to negotiate an overdraft to keep the company afloat but Hutchies was struggling to win new work. It was dark days for Hutchies as a whole, with Jack I passing away on April 27, 1964 – four months short of his 90th birthday. After realising his father and uncle were facing financial ruin, Jack III resigned from his secure job with the Qld department of works, bought a second hand ute and took on a carpenter’s wage (about half of what he was being paid at the time). Jack III visited the company’s UQ Gatton campus site and was shocked to find how outdated Hutchies’ business had become. He decided to initiate a major company member shake-up after speaking with his father. This decision returned the UQ project back to health and delivered the company a profit. It was at this time that Jack III officially took over from his father & uncle as they settled down into retirement. Jack III instigated a move to a new office, the Plaza Theatre located in Paddington, 47 years after Jack I had first bought the Montague Road premises. Under Jack III’s direction, Hutchies returned to a stable, profitable position by the end of the 1960s. It had eliminated its hefty overdraft, held a good credit rating and became popular amongst clients and architects to tender on projects once again. Over the subsequent years, with Jack Snr at the helm, Hutchies once again revelled in the respect and esteem of the business and building communities. The 70s were challenging years for the industry as a whole under the new Whitlam Federal Labor Government, but Hutchies managed to continue to ride out the tough times. Jack III capitalised on building work that other builders would not take on due to difficulty or remote location. Hutchies had its own employees skilled up to carry out these intricate projects and developed a reputation for completing projects of great complexity. Despite some tough times during the decade, Hutchies quickly outgrew its Paddington Plaza address and established a new office & yard at Seventeen Mile Rocks – an office Hutchies still owns and utilises today. From an early age, John Scott Hutchinson, or just Scott as he is known, knew he wanted to be involved in the family construction business. In the early 80s, Scott completed his Bachelor of Civil Engineering at the University of Qld. Scott then took off on an adventure with his mates overseas, travelling in a VW Kombi van. He returned to Australia in 1985 after having seen much of Europe, the UK and North Africa and then completed his MBA. Hutchies learnt the value of repeat business and if that meant following a client anywhere and completing any project no matter how small or large, it did. The client became the focus of the business, a company philosophy that has remained unchanged ever since. Scott started with Hutchies full time in 1986. His first task was to put on his salesman’s hat and go door-knocking for new business, following in the footsteps of his father in the 60s and 70s. Hutchies' current logo was designed when Scott realised the company had no official symbol. Scott decided on a simple process blue because it represented quality and bold letters because they gave a solid impression, symbolic of strong buildings & a strong company. The badge of honour that denotes Hutchies’ years in the industry was created along with it. In 1987, Hutchies began its 5 yearly tradition of celebrating milestone birthdays with a Gala function for its 75th at the Tattersall’s Club. The venue was chosen because Hutchies had built the dining room 50 years earlier in 1937. The event was apparently so good that it boosted company turnover significantly! In the same year as the 75th, company members, Len White & Barry Butterworth, approached Hutchies to form a social club which would help finance company events. A fishing trip that has become an annual team-bonding event was the first official social club excursion. Hutchies now has over 700 social club members and hosts about 50 other events purely to promote socialising amongst company members, clients, subbies and suppliers every year. It was also at this time that Scott introduced the idea of buying cars for company members. Hutchies now has a company owned fleet of over 300 vehicles. Hutchies completed a refurbishment for Lennon’s Hotel in 1988, just in time for the World Expo 88. This project turned out to be instrumental for Hutchies’ growth and progression as a company, as its successful completion with a tight timeframe and budget proved the company to be a credible competitor in the industry. The first big event in Hutchies’ world during the 90s was the marriage of Scott to Mary-Jeanne Peabody in September 1991. The year after, John Elmore (Jack V or Jack Jnr) Hutchinson was born. Siblings Terrence, Kenneth and Mary followed shortly after the arrival of Jack Jnr. After the marriage, it was time to think about the future direction of Hutchies. Most of the company’s work was coming from Jack Snr's long-established relationships with architects. Hutchies had also developed a solid office network with projects across Qld, a set up which is key to the way Hutchies operates now. In 1992, Jack Snr became Chairman of the board and Scott took over his post as Managing Director – the fourth generation Hutchinson to have hands-on control of the family business. Scott soon developed his own business network of friends like his father but this time it was with a new breed in town – young property developers. Hutchies worked out that loaning seed capital & mezzanine money to developers resulted in many more building opportunities. Hutchies became the preferred builder for developers which rocketed the company’s growth upwards. Hutchies' infamous newsletter 'The Truth' was first conceptualised in 1993 by Jack Snr who said "let's do it properly with the help of Lindy (Scott’s sister and a journalist) and send it out to all clients". Initially, Scott thought the idea was too crazy and shouldn’t be done… which was quickly replaced by the thought "of course we should!". The name comes from the scandalous & sensationalist ‘Melbourne Truth’ tabloid which started in the early 20th century and coincidentally it was last published in 1995. In 1995, Scott made a bold move to alter the structure of Hutchies and ever since, it has been known for its flat line management. Teams operate autonomously allowing team leaders to effectively grow their own businesses independent of the board of directors. Clients enjoy this style of management as they can pick which team they work best with. Scott continued the tradition of celebrating milestone birthdays with both the 80th and 85th held once again at the Tattersall’s Club. It was during the 90s that Hutchies also demonstrated its ability to work on an international scale by building the award winning Craggy Range Winery in NZ (pictured), as well as an $8M Orion Buses factory and $60M Western Star Trucks office headquarters, both in Canada. October 2001 marked a significant change to Hutchies’ board – with Greg Quinn becoming the first non-family member to hold the position of Managing Director. Jack Snr hand-picked Greg for the position after he was impressed by Greg’s work serving as President of the Qld & NSW Master Builders. Scott moved into the role of Chairman, letting Greg take the operational reins of the company. Steve Norton also joined the board as Finance Director, originally employed by Hutchies in 1996 in the position of Financial Controller. 2001 also marked 30 years at the helm for Jack Snr, who took the liberty of retiring, allowing Scott to take control of the position of Chairman. The 2000s and the changes in the board brought in lots of new work for the company including the landmark $99M M on Mary residential tower project – then Hutchies’ largest project ever. The company was now capable of looking after 150 projects a year and again became recognised as the largest commercial builder in Queensland. Earlier structural changes and a different strategic approach from the board meant Hutchies was resilient when the industry took a hit in 2006 and entered a downturn. Hutchies increased its core tradespeople and disciplines, added cranes, scaffolding & prefab to its books and set up its own training operation in order to encourage the Hutchies’ way right from the start - “get it right the first time”. Hutchies celebrated its 95th at its brand new purpose built office in Toowong Qld, and further down the east coast, opened its Sydney office. The new offices represented Hutchies’ new direction and allowed the company to spread further both geographically and into new sectors. Hutchies also took on another international project – this time a tourist resort in the snowfields of Niseko in Japan. Hutchies built Australia’s first 6 star Green Star commercial office tower – Santos Place, in Brisbane’s CBD. This was a landmark project for the company and only made possible with the help of our in-house ESD (Environmentally Sustainable Design) team which remains a core part of Hutchies’ business. Hutchies was lucky during the GFC, having built its strengths up over many years which came to the fore during these tough couple of years. It had strong buying power, loyal subbies, competitive pricing, a spread of locally owned offices and a reputation for quality work & financial independence. Developers and financiers had confidence in Hutchies and directed more business its way. Unfortunately, late in 2009, Jack Snr suffered a mild stroke while playing golf but recovered well in time for his 75th birthday. Accolades for his lifelong dedication to the industry started to flow in – with Jack being inducted into the Qld Business Leaders Hall of Fame in 2010 and included in the Australia Day Honours List as a Member of the Order of Australia for service to the building and construction sector. Since the GFC, Hutchies’ strategy has been to make sure it is geographically diverse and be active in all sectors of the marketplace. As a result, Hutchies opened new offices throughout the country and became a true national entity. It also became active in the mining sector particularly in Qld and WA, building many modular accommodation camps and facilities for large scale mining operations. Although Hutchies’ board started as a loose family arrangement, by 2011 it had evolved into a tight knit team with the experience and expertise to continue to grow Hutchies into the future. Kellie Williams joined the board as Project Finance Director after having originally joined Hutchies in 2003. Scott made his reality TV show debut on Undercover Boss in 2011 – say no more… except that he’s possibly open to more cheesy reality TV show appearances. 2012 marked a centenary in operation for Hutchies – a rare feat, especially for a company still owned by its original family. The party was the biggest Hutchies had ever put on, flying in every company member from around Australia to celebrate at the RNA Ernest Baynes Grandstand. Then Prime Minister Julia Gillard was in attendance and she gave a speech congratulating the significant contribution Hutchies had made to the country. Hutchies was also lucky enough to have Grinspoon play, along with Jack Snr’s country band. Hutchies’ reputation and financial strength continued to grow, and its Sydney team took on the $215M Metro Residences project in Chatswood. The project was the largest at the time in Hutchies’ history with 553 apartments and a workforce of more than 500 people. Scott has realised a dream of becoming an amateur beekeeper, installing hives on every Hutchies’ office roof and Hutchies’ honey available by the litre. He is also very passionate about the music industry as a board member of QMusic and ensuring Brisbane has a culture of fun – most recently known for campaigning against the Qld lockout laws. Scott converted an old wartime bunker into a music venue called The Triffid in Newstead which he is now landlord of. John Collins (JC) from band Powderfinger runs the bar and has become Hutchies’ new hub of social activities in Brisbane. In 2015, Hutchies signed on for its largest project yet which is still currently under construction – the $365M Brisbane Skytower. Skytower will also become Brisbane’s tallest building once it is complete in 2018. Radical changes to Hutchies' Melbourne office also occured in 2015, with the appointment of three new Team Leaders to expand Hutchies’ Victoria capacity & cover all market sectors. Hutchies remains a stable, quality force in the building industry. The company has $250M in cash & assets and is heading into its 105th year with over 180 projects on its books, taken care of by its 22 Team Leaders around the country. Hutchies has never been in a better position. Jack V, more commonly known as Jack Jnr, has joined the company and is now working in the John Berlese team as a Contracts Administrator. He is also firmly embedded in all of the board's activities, learning the ropes from his Dad and other directors who are mentoring him into the future role of Chairman. In 2016, Hutchies welcomed Russell Fryer and Owen Valmadre onto the board of directors, bringing the number of Hutchies’ directors up to 7. Steve Norton made the decision to semi-retire and is now serving as a Non-Executive Director. Early 2017 saw the completion of a brand new office in Coolangatta for our Gold Coast / Tweed team, headed up by Paul Hart and Levi Corby. Everyone is thrilled with the result, especially as it’s just 200m from the local surf. Hutchies' dedicated in-house Indigenous team is helping Aboriginal and Torres Strait Islander people into construction careers throughout the industry. Under this program, we have set a bold target to train and place 350 Indigenous jobseekers into employment within the construction industry by 2019. Scott has contributed $43 million of his own funding towards 312 Brunswick, a 3,500 capacity music venue dubbed as the new Festival Hall which is set to revive Brisbane City's nightlife. A number of new Hutchies' offices have opened up recently across Australia. The Sydney team has spread their wings, with Jayson Barnaby heading up an office in Wollongong. The Casey/McArthur/Nolan team also opened up three new offices in Geelong, Melbourne City and across the border in Adelaide. Peter Lee established an office in Darwin off the back of our success on the Gateway Shopping Centre project. Lastly, Hutchies has reopened an office in the Mackay/Whitsunday region, located in Airlie Beach and led by Kev Whitaker.